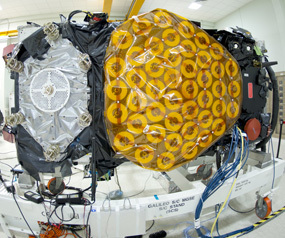 A third Galileo in-orbit validation (IOV) satellite reached its launch site in French Guiana today (August 7, 2012), where it will undergo preparations for a launch in October. The spacecraft along with the fourth and final IOV satellite (yet to shipped) will be launched aboard a Soyuz ST-B rocket, joining the first two Galileo satellites placed in orbit last year. 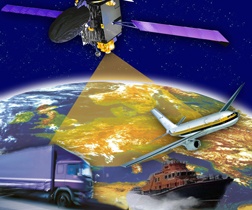 Meanwhile, Europe’s GNSS program has also inaugurated full operation of the European Data Access Service (EDAS), a new commercial service of the European Geostationary Navigation Overlay Service (EGNOS), as well as a 24-hour EGNOS help desk, both operated by the European Satellite Services Provider (ESSP) SAS under a contract with the European Commission. EDAS supports the multimodal use of EGNOS (and later on Galileo) by disseminating advanced EGNOS’ services in real time and within guaranteed performance boundaries, even when EGNOS satellite signals are not immediately available to users. The EDAS ground network gathers and distributes raw GPS data and differential GPS corrections collected by the EGNOS monitoring reference network in real-time using a variety of channels: the Internet, digital audio broadcast (DAB), and radio data service (RDS). The EGNOS helpdesk is designed to provide EGNOS users with a direct point of contact for questions related to EGNOS services (Open Service, Safety-of-Life Service and the EGNOS Data Access Service -EDAS), the EGNOS system and its performance, and applications. Up to now, users could only contact the EGNOS Helpdesk through a dedicated e-mail address. Since July 26, the EGNOS Helpdesk has been reinforced with the extension of the operating hours and the accessibility by phone. The English-language EGNOS Helpdesk now operates 365 days per year on a 24 hours basis, available by phone (+34 911 236 555) or e-mail <egnos-helpdesk@essp-sas.eu>.